Bilbo Baggins is comfortable in his snug, happy hobbit-hole in the side of a hill where he has lived all his life. One morning after a hearty breakfast, the wizard Gandalf arrives, and that’s when the trouble begins. Gandalf ends up inviting a flummoxing total of twelve dwarves over for tea the next day. The dwarves are on a mission to reclaim the glory and riches once held by their forefathers, but they need a “burglar” to help, and hobbits are small, stealthy creatures. Bilbo joins their party on a whim after being teased by the dwarves and praised by Gandalf for his yet-unknown abilities. He soon regrets his decision when the rolling fields past his home turn into a dark, foreign country, and he doubts that he has what it takes to carry out an adventure of this magnitude. As Bilbo meets (and is captured by) trolls, goblins, wolves, spiders, and wood-elves, he begins to use his practicality to his advantage; when engaged in riddles with Gollum under the mountain, for instance, his wit saves him from a very unfortunate end. And he puts his riddling skill to use with Smaug the Dragon as well, using their conversation as a chance to scope out the dragon’s weakness. Happy scenes are interspersed throughout the tale to keep Bilbo from despairing entirely: they rest at the Last Homely House as the guest of a friendly elf; the noble eagles of the mountain come to their rescue more than once; they find a faithful friend in Beorn, who is usually gruff and wary of visitors; and the men of Lake-town herald their arrival to oust Smaug the Dragon from the dwarves’ ancestral mountain. The Hobbit is one of the best books I’ve read all year. I know. I know! People have told me all my life that I need to read The Hobbit. But I always protested, claiming that I didn’t like fantasy because there wasn’t enough reality in it to “connect” to. Where I got this idea, I don’t know—possibly from my brothers’ fantastical explanations of Tolkien’s books, which sounded far too removed from me to be interesting. As Michael D.C. Drout explains in The Modern Scholar: Rings, Swords, and Monsters: Exploring Fantasy Literature, applying Marxist theory to the story helps to understand its appeal: Bilbo represents the bourgeoisie, the trolls are members of the Cockney-accented working class, and Smaug the Dragon is the ruling class, literally rolling in riches. Tolkien himself was certainly no stranger to literature and theory; his resume boasts of Anglo-Saxon literary and mythological study and translation. He incorporates themes common to Middle Age conquests while also sprinkling the book with a healthy dose of modern-day humor. Bilbo is an unexpected hero, the everyman who saves the day more than once. Though often he seems primarily occupied with eating breakfast, maintaining a tidy appearance, and yearning for his soft bed far from these dangerous adventures, he keeps a cool head when he and the dwarves seemed faced with certain doom. In fact, Bilbo’s practical considerations are often what save them; while the dwarves stubbornly refuse to tell the Elf-King the purpose of their quest, which leads to their imprisonment, Bilbo cleverly rescues them, though his unorthodox methods produce more than a few grumbles among the dwarves. Bilbo is an incredibly likeable character with whom I can closely identify; who doesn’t love a second breakfast? 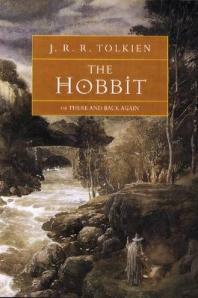 On a deeper level, Bilbo’s moral ambiguity makes him a realistic hero; when he is bargaining with the men and the elves that are preparing to battle against the dwarves, who have become offensively greedy, he begins by complaining that the entire matter has made him uncomfortable and cranky, and he offers goods stolen from the dwarves to appease the other side. The Hobbit originated as a story Tolkien told his children, and the excellent narrative style and the thrilling twists and turns took me back to the days when my parents would read me bedtime stories. I felt like running from the hulking, humped figures of the goblins, and I shivered at the enormous hairy spiders of Milkwood Forest. Because of its intensely imaginative plot and Tolkien’s masterful literary execution, The Hobbit is one of those few books that are equally attractive to kids and adults alike. But you probably already knew that!